Take your nails to the height of sophistication with Alaïa, our glossy, plant-based polish with a warm brown tone. A modern classic that looks great in the cool light of autumn. To set the scene, these are our 10-free nail polishes, made with an eco-friendly formula. - Color lasts for five days (unless you stuff your hand in your bag before your nails are dry – try to wait at least 15 minutes). - Even coverage, high shine, good vibes! Base & Top coat are always welcome to the manicure party! And what could be handier than our 2-in-1 Combo? What does plant-based mean? Well, we’ve replaced petrochemical solvents with those made from renewable, natural raw ingredients, such as cotton, potato, wheat and manioc. And this makes up 84% of our PURE color polish formula. As for harmful ingredients, we’ve sent them packing. Bye bye paraben, toluene, dibutyl phthalate, formaldehyde, xylene, styrene, camphor, resin of formaldehyde, benzophenone-1 and nanoparticles! All set? Even if you think your hands are clean, give them a good wash. Dust, cat hair, creams and dirt be gone! 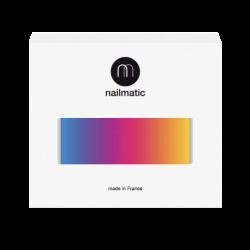 1/ Begin with base to increase your color’s hold and protect your nail at the same time. 2/ Our top tip for applying color: start with one stroke down the middle of the nail and then add one on each side. Be careful not to touch the skin! 3/ One coat of color is enough but two are even better for added coverage and longer wear. 4/ Top coat optional? Hmm… we strongly recommend it to increase shine and hold! Wear this polish to channel a minimalist look or to fix up and look smart for a job interview. Avoid filing your nails while you’re doing something else – chances are the result won’t be quite as precise as you might have hoped!